Last time I published “prom night advices” featuring only short dresses, a reader told me that some schools require long gowns. So I created long gowns outfits… Yet, as I was about to publish, I realized they were more more suited for Cannes red carpet. Gold, black and red, the trilogy of glamour. 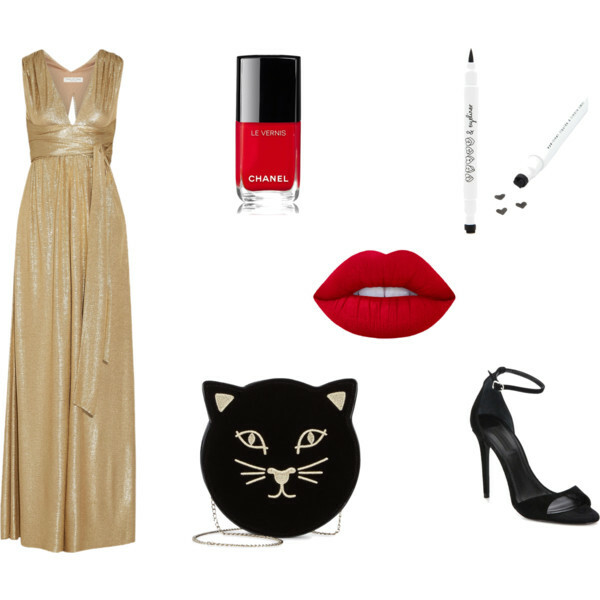 While the dress shines delicately, the shoes, bag and lips are softly velvety. Use a liner a eventually draw a dot, an heart or a star somewhere on your cheek, like a playful Marylin. A dress like a mermaid with accessories like precious sea shells and corals like makeup. The soft pink complements the dark green. The dress is long yet reveals the legs with a subtle transparence. It looked like a very precious chiffon. Shoes and earrings are baroque princess like while the makeup complements the gothic feel of the dress. And you? Do you have a long gown event to attend to? I would wear it in a very simple manner with a big cuff, a big ring, big earrings and heels you do not see, maybe sandals rather than pumps. I’ll try to post more often, keep commenting, I love reading you!